Most of the photos in this book are the work of the late Robin Hill. 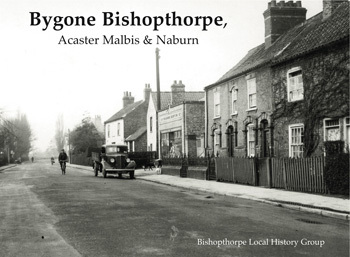 The publisher found his photograph albums on a stall at an antiques fair near Edinburgh some years ago, thought they were interesting and made contact with the local history group in Bishopthorpe, which is located just outside the City of York and was where York’s bishops resided. Robin’s photos date from the late 1940s and the early 1950s and record village buildings and events at a time when not many people did this. There are pictures of pubs, buildings, the local Show, the model railway engineers, but the most dramatic images are of the 1947 floods when a houseboat ended up in the middle of a field. Acaster Malbis and Naburn are included too and the captions are long and detailed, the product of much face to face and other research.